We regularly sell out, so if you buy a ticket and can’t make it, PLEASE contact the Rialto theatre and they will give you a refund and sell the ticket on to someone who can attend. Thanks! Come join us this February to learn about the importance of play, psychedelic medicine and evidence-based nutrition. With the usual nerd news, nerd quiz AND free cake. Matthew Bellringer: Don’t work, play! Adults have forgotten how to play. This is a big problem. Play is vital for creativity, growth and happiness. Other intelligent species spend much of their lives playing. What can we learn from them? What happens to your brain when you’re playing? Can you replace work with play completely? Matthew is a tech entrepreneur and student of business psychology. He’s helping people who take new approaches to personal development get in touch with the people who really need them. He is also partly giving this talk to remind himself to spend more time playing. Graham’s earliest memory was accidentally tripping on Strepsils aged 3 after secretly eating an entire packet. It’s not clear whether this kick-started his early interest in dreams, minds, consciousness, psychoanalysis, neuroscience, medicine and his gravitational attraction to psychiatry. Reading about LSD in psychology books in his teens triggered a fascination with the potential for positive, even healing, experiences with psychedelic drugs. Politicians and the media haven’t been kind to these molecules and there have certainly been casualties attributed to their widespread use. But perhaps the story isn’t all bad? Could the vilification of these substances make way for recognition of their potential role in the alleviation of human suffering? Dr Graham Campbell works as a consultant inpatient psychiatrist in Sussex. He completed a Neuroscience MSc with King’s College London/Institute of Psychiatry in 2012. In 2018, he became an Honorary Clinical Research Fellow with the Imperial College Psychedelic Research Group to support their second clinical trial of psilocybin for depression. Jess English: Coffee – black, hold the butter. To carb or not to carb? Paleo? Flexitarian? FODMAPs?! The world of nutrition science can be a confusing place. Eating is something that we’re all kind of experts at – but it can be tricky to translate these fancy, jangly terms into what exactly you’re going to put into your mouth. Jess will be taking a closer look at the world of nutribollocks and diet tribes; the evidence (or lack of!) behind it all and why the goalposts constantly seem to be moving – plus a handy guide to spotting it in the wild. Jess is a HCPC Registered Dietitian with a passion for evidence-based nutrition science and a particular interest in public health. She has worked in the NHS as a clinical dietitian, in public health and community nutrition and now runs her own private practice (Level Up Nutrition) where she’s on a mission to help people decipher nutrition science, translating it to fit their own lives in an easily digestible way. 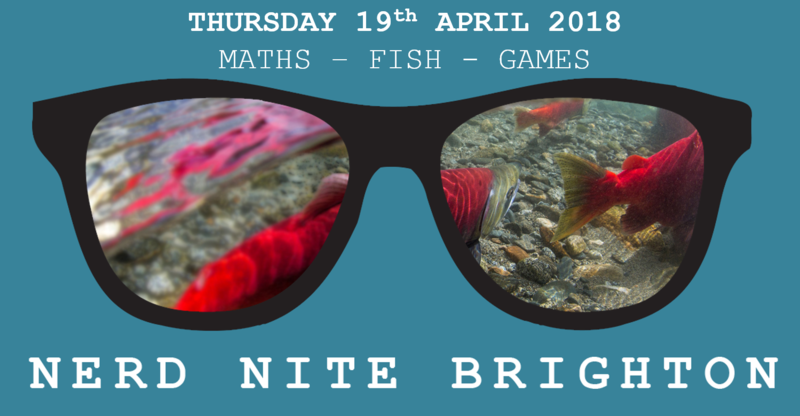 The first Nerd Nite of 2019! Come join us to learn about the trouble with facial recognition, the trouble with predicting the future and the need for non-lethal self defence techniques for time travellers. With the usual nerd news, nerd quiz AND free cake. Dr. Graham Hole: Why ID cards and CCTV are a bit of a waste of time. Graham is a Senior Lecturer in Psychology at the University of Sussex; he is interested in the psychology of visual perception and attention, especially in relation to “real world” problems (like face recognition and driving). Graham is particularly interested in finding out what information is actually extracted from faces in order to recognise them. He’s been doing research on face recognition for about 30 years now, and still has no idea about how we actually manage to recognise them (enlightened ignorance!). Dr. Julian Mayers: That Was The World That Wasn’t. If it’s difficult enough to gaze just a year ahead, how about the next 10, 50 or 100 years? Why is predicting the world of the future an almost impossible task? Astrophysicist Dr Julian Mayers has been fascinated by our visions of the future ever since watching John, Pete and Val bury the Blue Peter time capsule in 1971.He will look back who have been the best – and worst – predictors, show how Cosmology can help our understanding and ask why it is important to try to gaze into the crystal-ball anyway. Julian is a part-time astrophysicist – what might be quaintly termed as a ‘gentleman scientist’. His research at Sussex University includes weighing Black Holes, searching for the nature of Dark Matter and hunting alien X-ray communications. He is a BBC radio documentary maker and runs a video production company. Mike Capozzola: Self Defence for Time Travellers. Mike Capozzola is a New York-raised, London-based comedian and a published cartoonist (WIRED, Private Eye, McSweeney’s, MAD Magazine). He plays an agent in “Men in Black International” due out Summer 2019. The last Nerd Nite of 2018. 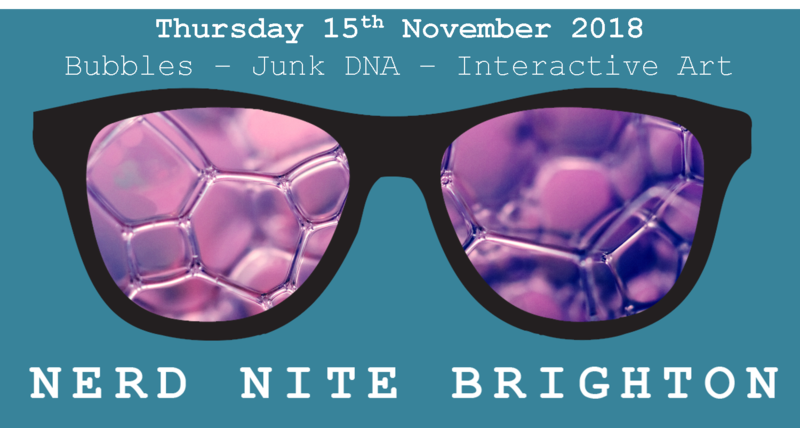 Come along and learn about soap bubbles, junk DNA and interactive art. With the usual nerd news, nerd quiz AND free cake. Dr. Filippo Cagnetti: Soap bubble and mathematics. Filippo graduated in Theoretical Physics at “La Sapienza” University (Rome) in 2003 and obtained his PhD in Applied Mathematics at SISSA (Trieste) in 2007. He enjoys very much both researching and teaching mathematics. He has worked at Carnegie Mellon University (Pittsburgh), Instituto Superior Técnico (Lisbon), and University of Texas (Austin). He has been a member of the mathematics department at the University of Sussex since 2013, and he loves living in Brighton. Dr. Alex Bousios: Most of our DNA is junk – but hugely important in the function and evolution of species. Alex received his PhD in molecular biology in 2009 from the University of Sussex. After a few years in Greece, he returned to Sussex in 2013, where he has now established his own research group as a Royal Society Research Fellow. His research investigates the evolution of plant genomes with a focus on its most abundant component, the fascinating transposable elements. Dr. Cécile Chevalier: Playing and Audience experience in Interactive Art Systems. Cécile Chevalier is an artist and Lecturer in Digital Art. She works with art installation and instrument making to explore forms of digital cultural transformation in relation to embodiment-technologies, performativity and performance. Her background is in Fine Art, Crafts & Design and Media Studies, while her current artworks and investigations draw from an interdisciplinary practices between conceptual and computational art and participatory/play theory. Cécile will draw from her collaborative artworks to discuss play theory in relation to Interactive Art Systems and instruments. “If you like nerds, raise your hand. If you don’t, raise your standards.” said author Violet Haberdasher. 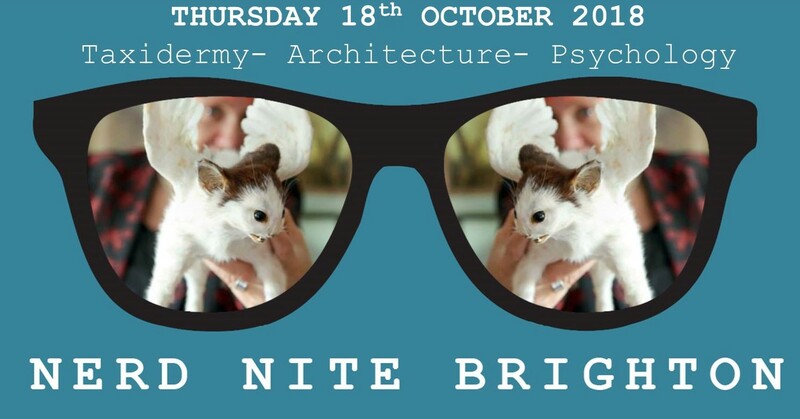 October’s Nerd Nite lets you raise your hands in the air, like you just don’t care, for the joy of learning about taxidermy, architecture and social psychology. Plus the geek fest that is our nerd quiz and nerd news. AND with free cake. It all started quite accidentally with a fish in a box. In the decade that followed, Kanna Ingleson intentionally accumulated a private taxidermy museum that is threatening to overrun her home in St Leonards-on-Sea. Here you will find a fully grown lioness comfortably cohabiting with a winged cat, a bunch of two-headed freaks and a couple of hundred stuffed creatures of varying age, beauty, and value. In this talk, Kanna invites you to discover what motivates an otherwise sensible woman to spend all her money and an unreasonable amount of time investigating and accumulating dead animals. She will talk you through some of the trends, techniques, oddities and personalities that have all contributed to this lively and ever-changing art scene. Kanna is the founder and editor of #taximag, an online and print magazine showcasing the taxidermy art revival. Duncan Phillips: The importance of Islamic architecture on everything we know about English architecture. Students who learn about architecture and the history of architecture in England are rarely told the complete story. This talk sets out to explain what it is all about and to fill in the gaps that the history books seem to miss out. Duncan is a chartered building surveyor who specialises in listed buildings and has surveyed thousands of Listed Buildings of every type and age, throughout England and Wales. He also lectures regularly on building surveying, architectural history and building conservation topics to professional groups and to Universities as a visiting lecturer. ‘Contagion’ usually translates as influence or spread of behaviour that occurs through mere touch, like a disease. Numerous simple behaviours (such as smiling, scratching, yawning, and laughing) and complex phenomena (such as riots) have been described as cases of contagion. A key problem for all these accounts is the evidence of social group boundaries to influence – mere touch is not sufficient. John suggests alternative ways of thinking about unintended influence in groups and crowds, based on the concept of shared social identity. John Drury is Professor of Social Psychology at the University of Sussex. He has researched numerous crowd events including the Hajj, the London bombings of July 7th 2005, the Hillsborough disaster and the 2011 English riots. His research has informed the training of the UK Fire and Rescue Service and crowd safety managers and stewards. He is currently the editor of the British Journal of Social Psychology. We regularly sell out- so if you buy a ticket you can’t use, please let us know on our Facebook event page so we can ensure disorganised nerds who forgot to buy a ticket in time can still come. 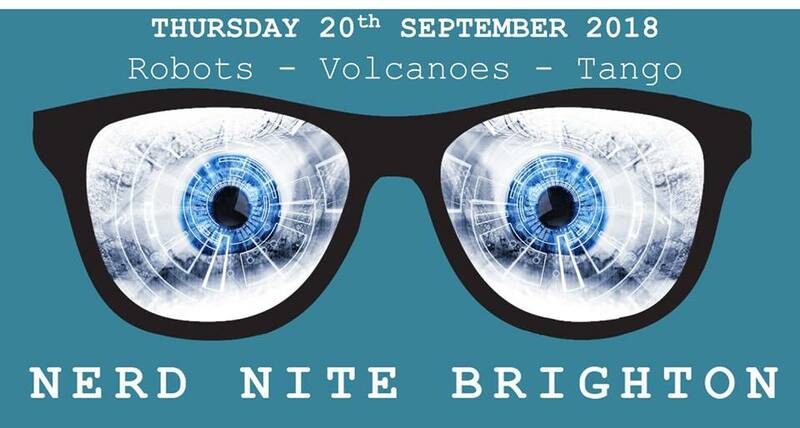 We’re back to nerd school this month with a bumper knowledge harvest where we’ll learn about robots, volcanoes and tango dance. Tickets on sale from Rialto theatre. Do you really know what a volcano is? How do they work? What kinds of damage they cause and how we mitigate and manage them? The world of volcanos is vast, destructive and quite often devastating, from pyroclastic flows to magma chambers and eruptions that take out entire towns how to do we keep ourselves safe? In this talk, I will review what volcanoes are, what the differences are and how this can be the difference between life and death. Bianca Fogah is a Physical Geography and Geology graduate from Brighton University. Since the age of 11, she has been fascinated with all things volcanology, seismology and generally destructive. Bianca currently works in administration but in her spare time with many passions for all forms of science, she wanted to share her geeky insights with you into the world of volcanoes. Argentine Tango, the passionate and subtle dance from Buenos Aires, has intrigued the world for generations. This talk will reveal the lesser-known aspects of the dance, and introduce a groundbreaking innovative application of its insights, including a live demo, if circumstances permit. Margarita first caught the Tango bug in 2000, started teaching Argentine Tango in early 2010’s, and talking about it publicly in 2013, with a TEDx talk on how tango seeps into the lives of those who dance it. She recently showcased an innovative learning format using tango improvisation at a conference at the University of Sussex. In this talk, Thomas will give an overview of some exciting recent work on the control of drones (quad copters), their autonomy and research in the “Brains on Board” project, in which he and his collaborators try to emulate the brains of bees and flies in order to build more robust autonomous robots. Thomas Nowotny received his PhD in theoretical physics in 2001 from the University of Leipzig and worked for five years at the University of California, San Diego. In 2007 he joined the University of Sussex, where he is now a Professor of Informatics and the Director for Research and Knowledge Exchange at the School of Engineering and Informatics. His research interests include olfaction in animals and machines, GPU accelerated scientific computing, hybrid brain-computer systems, and bio-inspired machine learning and robotic control. 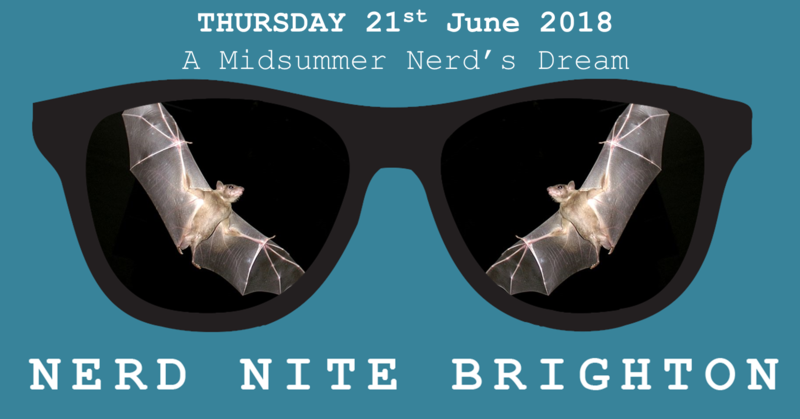 Who needs the World Cup when you’ve got Nerd Nite Brighton? We have passion, excitement and superb human beings – without the crushing misery of a penalty shoot out. 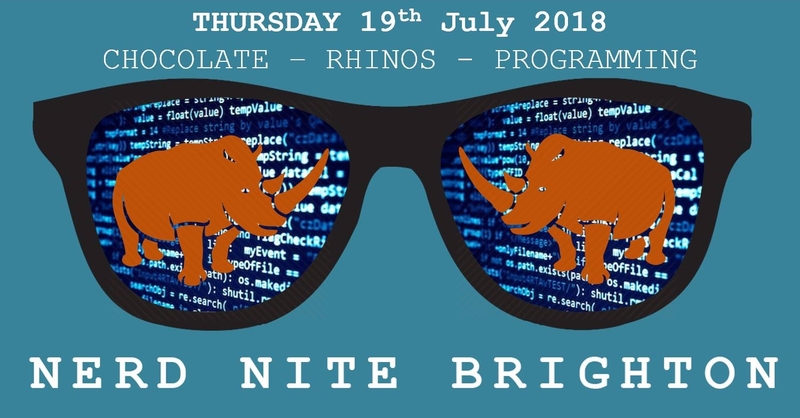 This month we have our usual diverse range of evidence based entertainment with some top quality speakers sharing their knowledge of rhinos, chocolate and programming. From a bean to a button, how can you make it do the conga and why is it not a good idea to send the Queen her head in a box. Jen Lindsey-Clark, Chief Chocolatician and creator of edible silliness such as the ‘Cumberbunny’ and a ten foot long ‘orient express’ chocolate train will share her nerdish passion for chocolate. After a 10 year career as a pastry chef and wedding cake maker, Jen focused her attentions completely on chocolate and its endless possibilities as a medium for art and choccy props. Jen has a chocolate workshop by the river Adur in Shoreham and when she’s not pushing the echelons of chocolate sculpture, Jen runs workshops and parties for chocoholics of all ages. She also shares her chocolate skills with students at Seaford College and visits other schools to open a window into her wonderful world of chocolate and the importance of that old saying ‘ a little of what you like does you good’. … and yes there will be samples. Kate Howland is a Lecturer in Interaction Design at University of Sussex, where she teaches on human-computer interaction, game design and cognitive science modules in the Department of Informatics. Her research examines how non-technical users can be more involved in the design and development of novel technologies. She most often works with user groups that face greater barriers to taking an active role in technology design, including children and older people. In this talk she will discuss the design of novice and end-user programming environments, highlighting the barriers to getting started with programming, and some of the approaches used by interface designers to tackle these. She’ll also talk about her research on the use of natural language in programming environments, including her latest project on voice-user interfaces in smart homes. Mxolisi Sibanda- Rhinos! Rhinos! Rhinos! Mx is Regional Manager for East Africa at WWF-UK. His role involves managing a portfolio of projects that we invest into in East Africa that include black rhinos, forest, marine and freshwater resources conservation in Kenya and Tanzania. He is an ecologist by training with degrees from Cambridge University, Wits University in South Africa and the University of Zimbabwe. It’s the longest day, so make use of it with some top class nerdery. We have a very diverse selection of talks this month: from HIV and mental health, to bats and physics. With added cake and beer. As Shakespeare didn’t say, “Lord, what nerds these mortals be”. A talk about how cultural norms are hard to challenge even when your life depends on it. Fungai is a passionate researcher in the HIV field with an interest in mental health and educating adolescent girls in making informed choices about their lives respecting their sexual and reproductive health and rights. Fungai has an MA in poverty and development from the Institute of Development studies and her dissertation focused on the mental health of HIV positive undocumented migrant women living in the UK. She sits on the SWIFT steering group and is a trustee on the Sophia Forum and AMAZE boards. Fungai currently works at the International HIV/AIDS Alliance and is starting her PhD at the end of this year. Her other passions include writing children’s books and gardening. Bats are incredibly important worldwide for pollinating important crops, but many species worldwide are at risk and populations have seen considerable decline. Bats have evolved a complex method of echolocation which allows them to catch insects as small as a midge by producing calls and listening to echoes bouncing off the insect. Different species have evolved unique call shapes, frequencies and patterns to catch their particular prey. Research into bat echolocation in recent years has been used to reduce the impact of large development projects on bats. Kathy Halsall is an ecologist at Mott MacDonald. Her work involves consulting on major UK projects including coastal defence schemes, new highways and rail schemes. Kathy has a particular interest in bats. She previously worked for African Bat Conservation in Malawi leading the urban research team on a new project to discover which species of bats were present in Lilongwe. She currently volunteers in her spare time for Bats Without Borders, a charity working to conserve bats in southern Africa, on the communications and media team. Particle physics asks mind-tingling questions about the nature of the universe: ‘why is there mass?’, ‘what is dark matter?’, or even ‘are there extra dimensions?’. These questions are our focus at the Large Hadron Collider. The vast, complex machines and computing challenges we have taken on in pursuit of answers to these questions are equally fascinating, from magnets operating at temperatures colder than space, to training computer programmes to learn by themselves. Dr Lily Asquith has a PhD in High Energy Physics. After a four-year post at Argonne National Lab, Chicago. Lily was awarded a Royal Society Dorothy Hodgkin fellowship in 2014 and is now working in the Experimental Particle Physics group at the University of Sussex, analysing data collected with the ATLAS detector at the Large Hadron Collider, CERN. It’s our 50th Nerd Nite! Come celebrate with evidence-based entertainment, cake and beer. Be there and be square. Mahmoud Maina is a postdoctoral fellow at the University of Sussex studying neurodegeneration. Mahmoud obtained his BSc in Human Anatomy from the University of Maiduguri, and then lectured at the Federal Neuropsychiatric Hospital Maiduguri, Nigeria. In 2011, Mahmoud joined the University of Sussex for an MSc in Cellular and Molecular Neuroscience. He was then awarded a Chancellor’s International Research Scholarship (CIRS) for a Ph.D in the Serpell Lab on the role of nuclear Tau in Alzheimer’s disease, which he recently completed. In his spare time, Mahmoud is a passionate science communicator, for which he was awarded a science communication award in 2017 by the Royal Society of Biology. He founded the TReND in Africa outreach programme and serves as the outreach coordinator. TReND have inspired thousands of students about science and continue to enhance public understanding of science. Mahmoud recently became a Fellow of the Royal Society of Arts for the purpose of enlarging science through public engagement in Africa. After investigating cancer for 6 years, Katy now spends her time promoting opportunities for scientists to inform, collaborate and co-produce research with the general public. She currently works at the University of Sussex as Public Engagement Coordinator, and leads initiatives around Brighton that increases interaction with science: she co-founded the British Science Association Brighton and Hove branch and STEMbusters. 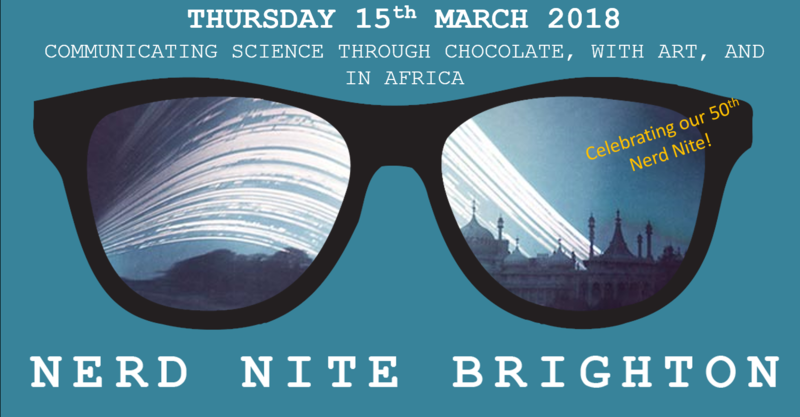 She is passionate about promoting minorities in science, supporting local activities such as Soapbox Science Brighton and Out and About STEM, and believes if anything can get people participating in science, a chocolate lab can. Nick Sayers is a science-inspired artist based in Brighton. He has made drawing machines from bicycles, six-month-exposure pinhole cameras from beer cans, geodesic shelter domes from estate agent signs, and has Cycled The Solar System in Goa. He has shown his work internationally at art and science events in countries including India, Canada, Azerbaijan, United Arab Emirates, Uzbekistan, Holland, USA, Portugal and Hungary. Nick will discuss his work, and how it has communicated science to a wider public in a creative, quirky and engaging way.